2012 RIBA Stirling Prize Awarded to BREEAM Excellent Sainsbury Laboratory at Cambridge! The 2012 RIBA Stirling Prize was just awarded to Stanton Williams‘ BREEAM Excellent Sainsbury Laboratory at the University of Cambridge! The winning project was a surprising choice – it’s neither the fan favorite nor one of the top guesses among industry professionals – but the incredibly thoughtful and sustainable approach to a type of building that is often simply utilitarian demanded a second look. Designed by Stanton Williams, the Sainsbury Laboratory is a plant research center in the Cambridge Botanic Garden. Not only did the building need to be functional, with meeting rooms, research areas and a cafeteria – it also needed to live up to the illustrious history of the Botanic Garden, which was originally laid out by Charles Darwin’s mentor John Henslow. Stanton Williams stepped up to the challenge by creating a space as beautiful as it is functional. The Laboratory is centered on what is called “the thinking path,” which is a play off of the route that Charles Darwin walked each day as he contemplated his work. This path creates a continuous route that links together the different spaces within the Laboratory. According to Ian Stanton, the garden and the building were carefully integrated, with the garden reflecting “the past of plant science and the building the future.” The ecologically sensitive location and nature of the work happening in the laboratory required a special building. 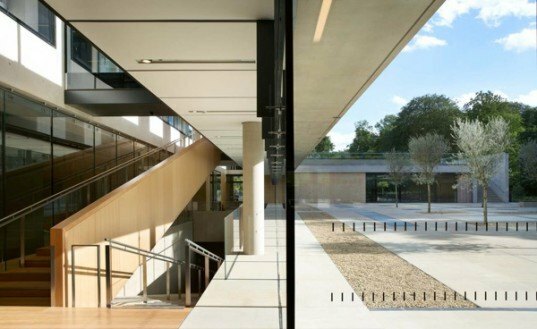 Although laboratories usually demand a great deal of power, the Sainsbury Laboratory achieved a BREEAM Excellent rating – the highest rating possible – with the help of over 3,000 square feet of photovoltaic panels and plenty of natural light. Every laboratory room receives natural daylight, which is very uncommon. A quick look at the stunning layers of stone and concrete, the stage-like drama of the laboratory research rooms, and the intelligent space layout (which encourages both reflection and interaction), and it is easy to see why the Sainsbury Laboratory took the prize. The 2012 RIBA Stirling Prize was just awarded to Stanton Williams' BREEAM Excellent Sainsbury Laboratory at the University of Cambridge! The winning project was a surprising choice - it's neither the fan favorite nor one of the top guesses among industry professionals - but the incredibly thoughtful and sustainable approach to a type of building that is often simply utilitarian demanded a second look.